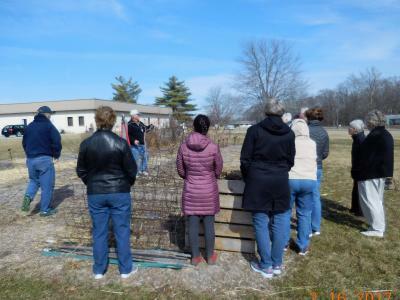 At a recent University of Illinois Extension Master Gardener training class, held at the Extension office in Springfield, a group of Master Gardener trainees observed firsthand the proper technique for pruning grape vines. The lunch time demonstration was presented by Master Gardener volunteer Bill Budd in the Fruit and Vegetable Demonstration Garden outside the extension office located at 700 South Airport Drive, Springfield. As you can see by the pictures, grape pruning often entails removing 80 to 90% of the vines. Bill pruned the garden's four-year-old vines by cutting the cordons (arms), and selectively removing side canes, leaving a distance of approximately 6 inches between the remaining canes. These canes were then trimmed back to approximately 3 to 6 buds each. It was one of the season's first opportunities to get out in the Garden and was just a hint of much more work to come. also check out the Utah State University You Tube Video.